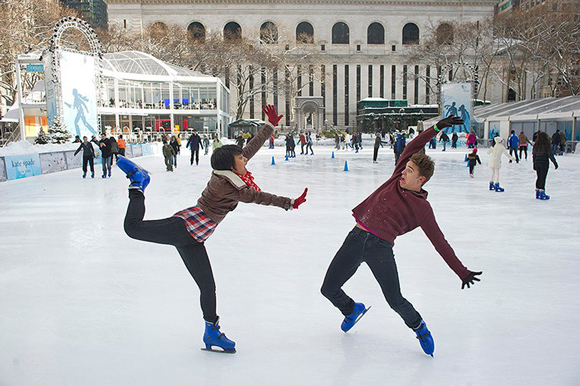 Would you believe that these two aren't professional ice skaters? In actuality, the pair are professional dancers (Ellenore Scott and Michael McBride) posing for photographer Jordan Matter's ongoing series, Dancers Among Us, that features "professional dancers in everyday situations around the city". The photo, staged at Citi PondSM earlier this season, is one of over 100 captivating images in the Dancers Among Us gallery. On his blog, the photographer reveals some behind the scenes images from his shoot at the Pond (and many other locations around the city), the indiscretion that got him in trouble with a skate guard (oops), and the fact that not only are his subjects not professional skaters, but neither of them can skate very well at all (they sure know how to fake it for the camera)! While browsing Jordan's gallery I came across an equally impressive photo, featuring dancer Minsung Kim in Bryant Park's 42nd Street Allee. The man makes eating chips upside-down look easy.